Backup Vault is the complete solution for your business or personal backup needs. Featuring unmatched security, robust version control, and online restore of data 24 hours a day! Contact one of our sales engineers to discuss your specific needs, and how Backup Vault can help you meet them. Join the hundreds of clients who have already chosen our Backup Vault solution, and start protecting your data today! 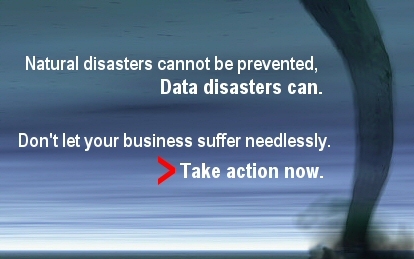 Tornados, hurricanes, earthquakes, power surges and outages, employee mistakes or sabotage - there are simply too many opportunities to lose your mission-critical data. Service from Backup Vault helps to ensure that your data will survive... even if your computer hardware doesn't. Consider for a moment the valuable role that computer data plays in your life and business. Many households and businesses spend hundreds of dollars a month on other, less critical, elective expenses - while leaving their most valuable asset, their data, totally unprotected. Service with Backup Vault is the most economical, secure and automatic way to insure your data. Backup Vault uses the world's most popular and secure software, which has been securing data for more than 19 years. Assuming that the employee responsible for the backups, removal of media, verifications and restore processes is on a salary of at least $30,000 per year, and using the minimum time dedications outlined above, the cost of properly backing up an SMBs data is about $71.25 per week, $285 per month, and $3,420 per year – not including hardware. If you factor in the cost of true manual ‘rotation’ of backup copies to a secure offsite location using a courier service ($300 per month+) and the aggregate costs associated with restoring data from tapes or the internal costs of managing a single total loss/restore event, the costs of in-house backup can skyrocket to well over double the previous estimate. Compare this to our Backup Vault service, operating automatically at non-peak hours, and without imposing on your existing staff or adding hardware or media resources of any type. Typical average charges for Backup Vault service might be $50-$100 per month, resulting in a minimum cost savings of between $2,520 and $3,760 per year.